Whether at home or at work, getting a fast and reliable internet connection should always be your priority when choosing a data plan that is right for you. But even with a premium internet plan, you still can’t avoid momentary loss in connection or even slowdowns that may come from time to time. If these problems already happen frequently, you might need to take actions immediately before they can cause more serious issues in the future. Being late with your report submissions at work or getting disrupted when watching your favorite series because of internet problems can be a bit frustrating for most of us. Fortunately, there are ways in which you can improve your internet speed even without the help of an IT expert. After you have cleared out possible causes such as problems with your ISP (internet service provider), faulty hardware, and signal interference, you may already try some ways to improve connection speed. 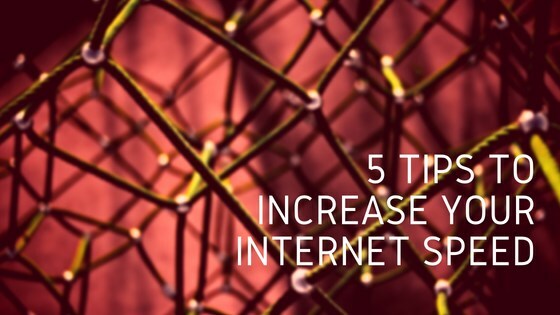 Check out these five tips to increase your internet speed and start making the most out of your broadband plan today. One of the most common causes of a slow internet connection is using a bad router or modem. In most cases, your internet service provider will provide you with a unit upon installation. Little do people know that these default devices are currently not the best ones on the market. You can find lots of different Wi-Fi modems that are specifically designed to deliver a fast and seamless connection at reasonable prices. You may also use repeaters, boosters, and extenders to improve the range and strength of Wi-Fi signal across your home or office. Check out this Wi-Fi extenders list to start. Other possible causes of a decline in internet speed may come from the devices that are connected to your router or modem. Make it a habit to turn off devices such as laptops, smart televisions, and mobile devices when they are not in use. You may opt to schedule firmware updates and app installations during off-peak hours too. Sometimes internet connection issues can be solved by simply rebooting your router. Power cycling your device can help clear some minor problems that cause slow internet connection. Remember to always keep your modem updated with the latest firmware to ensure maximum compatibility at all times. Your wireless modem needs to be placed in the right spot to maximize the speed that it can transmit. It should be placed in a cool and open area where it can get proper ventilation while being protected from sunshine and dust. Place it on an elevated area and away from physical barriers. Keep it centralized and nearer to the locations where you need a fast internet connection the most. Physical barriers such as walls, doors, and cabinets may not be the only ones that may interfere with the Wifi signal. Wireless phones and cameras with similar frequencies can also interrupt the connection. Other devices that may cause the problem include Bluetooth devices, mobile phones, televisions, motion detectors, wireless speakers, remotely-controlled electronics, and others.